Last week I posted some notes on the translation of the Nicene Creed. So I’m leading chapel today. A service of communal intercessions. Hmmm, what liturgical hymn to use? How about Lutheran Book of Worship 939: “You are God, we praise You. You are the Lord, we acclaim You.” Notice again the “we.” This is the old Lutheran Worship Hymn of Praise from Morning Prayer. It is simply an alternative (and more accurate) translation and setting of the Te Deum, which is used also in the Order of Matins in The Lutheran Hymnal, Lutheran Worship, Lutheran Service Book. The Te Deum is a phenomenal text, and, if played and sung in the right setting and with gusto, creates an atmosphere of majesty that is, I think, unparalleled. This hymn goes back to the fourth century, and may have been composed by Nicetas of Remesiana (in Greek in the fourth century) but has been passed down, in Latin, as part of Matins since the sixth century. I have a beat-up old German Bible from the 1680s, printed in Nürnburg. In addition to the standard OT/Apocrypha/NT, like many Lutherbibeln it includes the “Four Ecumenical Creeds” and the Augsburg Confession. What is the “fourth” ecumenical creed? The Te Deum, of course. And, as a confession of the Church, it is confessed together: We. Us. One. Te deum laudamus te deum confitemur . . .
You the holy church on earth throughout the world confesses. Notice the connection back to the opening line: ladaumus / “We praise” . . . confitemur / “We confess” is repeated with laudat / “apostles,” “prophets,” “martyrs praise” . . . confitetur / “church confesses.” Great stuff. You’ve got all of God’s people there: Those who spoke the Good News (apostles, prophets) which created the (one) church; the martyrs who testified with their lives to that Good News and now await the end result of that Good News, the resurrection; and those of us still on this terrestrial orb who are part of Church. We, all together, with one voice, praise and confess. There is no “I” in the Te Deum. There are a couple other hymns based on the Te Deum scattered throughout LSB: Notice the “we” in Luther’s “We All Believe in One True God” (953, 954); notice the “we” in my personal favorite, the adaptation by Stephen Starke set to the phenomenal fourth movement of Gustav Holst The Planets (I commented on Holst’s piece last year). For the latter, though, the music and text is so awesome that it is disappointing to hear it sung by a congregation unfamiliar with the tune. So practice it with the congregation, then sing it. The “US” is so sweetly depicted in John’s Revelation of hope, especially by the great multitude in the final stanzas of the Te Deum (Rev. 19). Come quickly Lord Jesus so we may enjoy the wedding feast for enternity! Sure, bring up Revelation, Rob. Don’t get me started. I love the way the lists work in the Te Deum. As a poem, they remind me of Whitman at his best. Or maybe Whitman reminds me of the Te Deum. Either way, it is a sublime hymn of praise. Latin (and Greek) are far better for poetry than English, because the function of the word in the clause is based on the form, not the position. So “Te” in the four consecutive lines quoted above is the accusative (direct object), but in Latin that can stand first in the sentence, in this example placed first for emphasis (and, my translation into English matches somewhat the Latin structure, but is a bit nonsensical in English as a result). And, because Latin (like Greek, German, etc.) is inflected, the same terminations can be used, creating similar and even identical sounds at the ends of the lines. So “chorus” “numerus” and “exercitus”. One of these days I’ll post something about the Dies Irae, another incredible (albeit terrifying) liturgical piece. Though one we’ve chosen not to use any longer. The “Historic Liturgy” is constantly adding, changing, and dropping things along the way. One other note on this: Three adaptations of the Te Deum in Lutheran Service Book (939, 940, 941) are all placed in the “Biblical Canticles” section. Surely this is a mistake. They should have been placed in the following section, under “Liturgical Music.” Not a big issue, obviously, it is not like it really matters. Almighty God, you have given us grace at this time with one accord to make our common supplication to you; and you have promised through your most beloved Son that when two or three are gathered together in his Name you will be in the midst of them: Fulfill now, O Lord, these desires and petitions as may be best for us; granting us in this world knowledge of your truth, and in the age to come life everlasting; through Jesus Christ our Lord. Amen. It is attributed (probably spuriously) to Chrysostom, but came into English via Cranmer’s Prayer Book. It has been added to the Morning Prayer service now also in Lutheran Service Book. Notice, again, the first person plurals: “us,” “our,” and a phrase lifted from Acts: “with one accord” (ὁμοθυμαδὸν – Acts 1:14; 2:46; 4:24; 5:12; 15:25). Yesterday, since our Center for Hispanic Studies students are on campus for classes, Vicar Nelson Rodriquez also led the same prayer in Spanish. 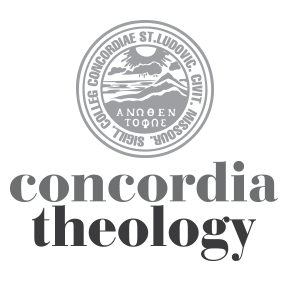 Nelson, BTW, is featured on pp.8-9 in the latest “Concordia Seminary” magazine. “With one accord,” no matter the tribe or nation or language or people. My favorite setting of this is Herbert Howell’s “Collegium Royale”, with the traditional text. Take a listen!